DEBOND is a non-staining, low VOC, concrete form release for application to all types of concrete forms. DEBOND is a pale, fast drying, ready-to-use, sprayable liquid that is low odor. DEBOND forms a water resistant chemical barrier and reacts with the alkalis in the concrete to prevent concrete stickin..
DEBOND is a non-staining, low VOC, concrete form release for application to all types of concrete forms. DEBOND is a pale, fast drying, ready-to-use, sprayable liquid that is low odor. 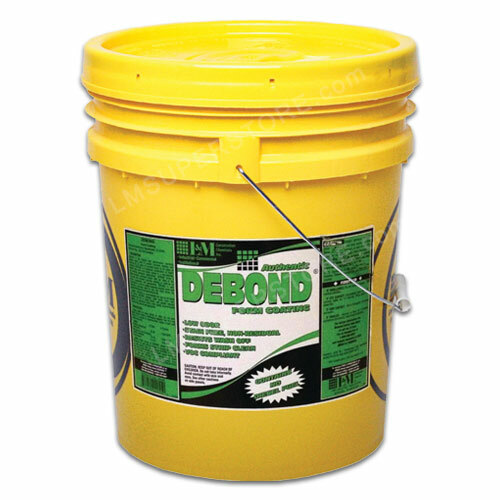 DEBOND forms a water resistant chemical barrier and reacts with the alkalis in the concrete to prevent concrete sticking or build-up on forms, equipment and accessories coming in contact with concrete. The resulting concrete is stain and residue-free, ready to receive paints, mortar, moisture proofers, plaster or other toppings. DEBOND is a specially balanced combination of highly refined fatty acids carried in a non-staining, non-residual petroleum mineral oil. DEBOND is free of kerosene, oils, diesel fuel, fuel oils, waxes and resins. It is non-toxic and non-irritating. DEBOND is not harmful to concrete surfaces. In addition, DEBOND resists rain wash off and will not break down under heat or sun. Forms can be coated up to five weeks prior to pouring concrete. DEBOND allows concrete to release chemically from various media such as steel, plywood, aluminum, and composition forms. DEBOND is ready-to-use and can be applied by sprayer, or other conventional methods. The film dries rapidly; reducing dust accumulation, offers non-slip placement, and resists normal rain wash off. Forms strip clean, eliminating concrete repair. The regular use of DEBOND minimizes bug holes. DEBOND protects and maintains forms. Premium quality release for pre-stress and pre-cast plants. Helps minimize concrete build-up and bug holes. Effective over all types of forms in all types of weather.